The first time my cowboy husband came home and said, “Honey, start packin'” was terrifying. I thought, Oh my gosh, we won’t have health insurance and I’m four months pregnant! Where will we live? Will we be able to afford food? I can’t live on Top Ramen and table salt! We won’t have a paycheck for…..who knows how long! The second time Mr. Buckaroo came back into the house at 8:30 AM and said, “Honey, start packin'” was unsettling. I though, Oh, not this again. Well, I survived the traumatic C-section experience of birthing our daughter, surely I can pack a few boxes and not lose my mind. Moving unexpectedly is inconvenient, but it won’t kill us. This third time around, I’m like, Good thing I saved all our moving boxes. Most are even pre-labled for easy packing. Where to now, Cap’n? Cowboys change jobs for various reasons, but it seems like even when they leave a job on good terms, it’s always a sudden announcement to the wife. This time around, we had a month to look for a job, so we had time to pack in an organized fashion. I won’t pack a coffee cup and a mason jar in my boot bag again, I promise. At least now I have a 14-month-old and my good health instead of a newborn and a case of mastitis. Part of the fun of being a buckaroo family is getting to travel around the country (well, if you consider the Great Basin its own country. We kind of do) and see different places and meet new people. It was something Jim and I each liked to do when we were single, so it’s not a big surprise we’re continuing the lifestyle as a family of three. 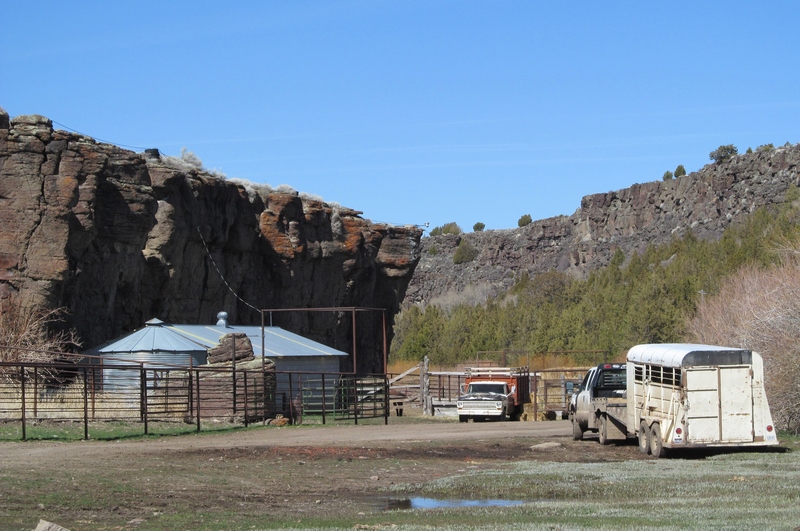 We’re headed to the Alvord Ranch in Eastern Oregon in a couple weeks. We’ll be as remote as we are at the Diamond A in terms of grocery shopping, so I’m a little bummed about not having access to fresh fruit and veggies. There are several families that live right there at ranch headquarters, so I’m excited about that. People! Different kinds! To talk to every day! And we’ll have a beautiful view of the Steens Mountains, and the hay meadows and desert beyond. It’ll be a welcome change from the current rimrock/rimrock/oh look, more rimrock view we have from the bottom of our canyon dwelling. I haven’t seen a sunrise or sunset in a year. Do they still have those? I hope so. We’ll be living in a two-story, four-bedroom, two-living room house. You know what that means: furniture shopping! And lots more cleaning. Bleh. I can’t wait to see what the inside of the house looks like; is there a hallway? Does the bathroom have medicine cabinets? Is there a front porch? Our house won’t be ready for a couple months, so we’ll be staying in a studio-type guest house on the ranch until then. I’m a little nervous about living in Oregon, mostly because I don’t know how to do the Oregon fly-by in a branding pen. Jim said it’s just like forefooting horses, so I can do it. I guess if my biggest worry is the local branding style, I’ll be okay. So long, rimrock rabbit hole. Hello, daily viewings of the sun on the horizon.